Dorothy Robbins, 91, formerly of Abilene, died Wednesday, November 25, 2009. Graveside services will be 2:00 p.m. Sunday, November 29, 2009, in Tuscola Cemetery with the Reverend DeWayne Bush officiating, directed by Fry-Bartlett Funeral Home in Tuscola. Visitation will be 6:00 - 7:30 p.m. today, Saturday, November 28 at the funeral home. Dorothy was born September 29, 1918, in Winters to David and Lillie Mae Holmes Dean. She graduated from high school in 1936 in Tuscola and married Troy Clyde Robbins July 8, 1937 in Tuscola. In 1941, the couple moved to Abilene from Tuscola. She worked for several businesses in Abilene including T. S. Langford and Sons and the Rita Barber Company. 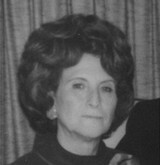 She retired in 1985 from Abilene State School, where she had worked ten years. In 2007, she moved to Prosper, and to Frisco in 2009. She was a Baptist. Preceding her in death were her parents; her husband April 4, 1972; one daughter; six brothers; and four sisters. Survivors include one son, Ron Robbins and wife Linda of Prosper; one daughter, Peggy Houghton of Ft. Worth; four grandchildren; four great-grandchildren; one great-great-grandchild; and several nieces, nephews and cousins.